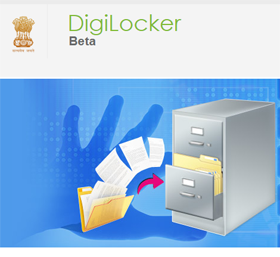 Government of India has recently launched DigiLocker – Digital Locker, facility to store important documents online. You can store birth certificate, PAN card, Ration card and other important documents in this locker. This facility eliminates need of carrying physical copy of your important documents with you. 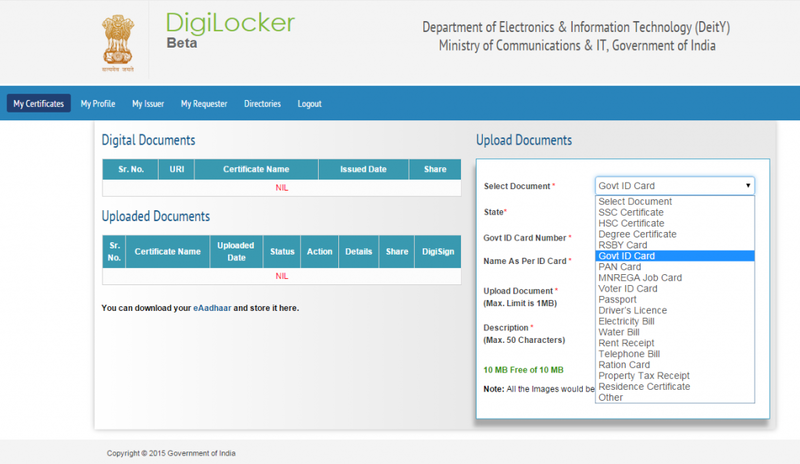 Digital Locker is part of Prime Minister Narendra Modi’s Digital India program. Department of Electronics & Information Technology (DeitY) has launched a beta version of a digital locker. Let’s discuss in detail about digital locker. DigiLocker is online secure storage provided to store important documents. Once documents are uploaded on this site it will act as authorized documents. You need not to carry physical documents, you can send link of uploaded documents on digilocker. Aadhar card is mandatory to open digital locker. You can sign up for digilocker by using UID number appearing on your Aadhar card. Once you input your UID number, system will generate OTP (one time password). This password will be sent to your register mobile number. You need to input this OTP to validate your id. Once your digital locker is opened system will redirect you document Upload page. Using this upload page you can upload your documents. Which Documents can be uploaded on DigiLocker? You can upload any documents to digital locker. Before uploading any documents you need to select document type from drop down menu. Drop down menu allows you to select documents like PAN Card, Voter ID Card, Passport, Electricity Bill, Ration card, Degree certificate, Residence certificate etc. File format of PDF, JPEG, GIF, BMP & PNG is only allowed. Maximum size permitted for document is 1 MB. Free space provided on Digital locker is 10 MB. I advise apart from uploading document mentioned above, you should use this facility to upload financial documents like FD receipt, Investment receipt, property dead or any other financial documents which you feel important for you. Do you think digital locker facility will help you? For More information go through this FAQ. Its a great initiative, these documents are important and don’t remain the same condition even if kept and safely managed. My birth certificate is in a very critical state and I am really scared to carry it anywhere. The digilocker comes at the right time and would certainly help everyone it looks like. Is someone behind the system really verifying the uploaded document? Yes at back end this documents will be verified.Even if you try to give wrong information e.g Wrong PAN Card number system will not accept. As mentioned on http://digitallocker.gov.in/ this system will provide authenticity of the e-documents.